In response to a global market need to groom more HR-savvy business leaders, HR Certification Institute (HRCI) announced plans to offer, in May 2018, the Associate Professional in Human Resources – International™ (aPHRi™). For students, early-career HR professionals, non-HR practitioners and those transitioning into HR roles, the aPHRi desinates foundational knowedge of talent management practices in a country outside of the United States. 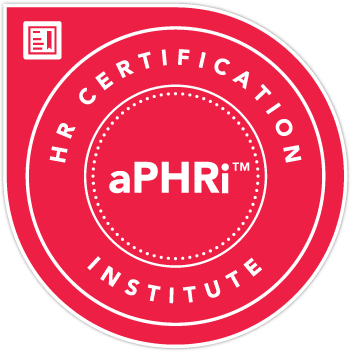 If you are new to HR and want to distinguish yourself early on, the aPHRi from HRCI is the perfect certification to help propel your career growth and provide you with the confidence to launch into the HR profession. Be one of the first to earn your aPHRi — earn the aPHRi and prove your knowledge of foundational Human Resources in any locale. In keeping with our tradition of delivering the best content for the greatest value, we have just released the aPHRi prep materials 2018 with workbooks, test bank and the instructor PPT slides. As long as you are preparing for and taking the HRCI's aPHRi exam for which you purchased our prep materials, we will ensure that you have Access Until You Pass within 12 months. Your electronic material will update automatically when new editions are released and when content revisions are made. Please click here to see the aPHRi study package. To order the Instructor materials, please click here. We GUARANTEE that all components of the iHRCI prep materials for both candidates and instructors will remain current for at least 12 months from your purchase date.